In 2005, after years of gainful employment, husband and wife team Richard and Sally Gibbons decided to take control of their own lives. 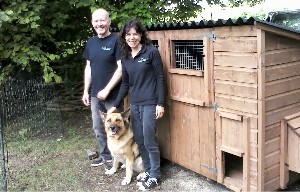 After examining many ideas the final choice of business seemed obvious, combine Sally’s passion for animals and animal welfare with Richard’s skills as a carpenter. So Timber Flair was born. From the beginning, our ethos at Timber Flair has always been to design and manufacture housing with the occupier and keeper in mind. Our first design thoughts are always, what is best for the animal and how can we make husbandry simple for the keeper. This is where a specialist animal housing producer differs from a shed manufacturer or DIY store. We also aim to offer more innovation, better quality and a better service than our competitors, while remaining competitively priced. Our very high quality, practical, affordable products seemed to be exactly what people wanted and by 2008 we had outgrown our first premises and moved into a newly refurbished unit at Compton Green Business Park. Even through the worst recession in living memory our reputation for quality and value for money has seen us continue to grow, to the point that by 2011 we once again had to move to a larger unit to cope with demand for our housing. The continued growth in the business has meant that by the spring of 2012 we were able to purchase our own property at Poppy Meadow. Based in rural Gloucestershire, Timber Flair is proud to have supplied housing to many satisfied customers including; Cat rescue charities, Professional poultry breeders, Professional dog trainers as well as numerous private customers.